Indian economy is growing fast; it is much discussed and talked subject in the present times amongst the residents of urban India. It is second fastest growing economy in the world after China, which aspires to have double-digit growth in the times to follow. Urban India visibly portrays that kind of development through the expansion of physical infrastructure and the provision of amenities, though not adequate to cope with the fast migration of striving rural class towards urban centres. Another topic of discussion amongst the argumentative Indians is the issue of governance which off late has become a serious problem as day after day a new scam is getting unfolded and the media as the fourth pillar of democracy is able to influence people conscience in different ways. 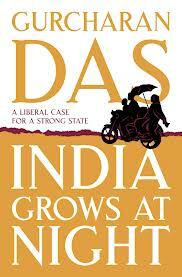 In these times an acclaimed author and columnist, a management guru (as Arvind Kejriwal calls him), an erstwhile corporate leader, Gurcharan Das brings out this book in the title of ‘India Grows At Night (IGAN) – a liberal case for a strong state’. As he mentions he intended to keep the title as ‘India grows at night when the government sleeps’ and he drops the later half and settles for first. However the book keeps the reader reminding that in spite of the governance deficit growth is taking place which is praiseworthy. One tends to wonder as to what would have been the situation had there been better governance. I am sure as regards to the economic growth; India would have surpassed China by this time easily. But that was not to happen. An excellent case of comparison between Faridabad and Gurgaon in the backdrop of Indian Polity, Policy and Partnerships of private as well as public initiatives is exhibited in the book to which the reader is reminded many times as and when the reference is required. One a sparkling star whereas another one getting to fade off. The former is Gurgaon and the later is Faridabad. I myself have observed it when I visited Faridabad first time sometime in late 80s or early 90s, it was a much better township as compared to erstwhile Gurgaon. Having read India Unbound, another masterpiece by Gurcharan Das, I somehow could relate and preempt the interventions made by IGAN, though not agreeing to all points made by him. However I enjoyed reading the book with full involvement, concern and commitment to the cause of the book. The transformation in the visible indicators during last 20 odd years is appreciated in the book apart from the dismal conditions of social infrastructure viz., education, health, sanitation, etc., especially in rural India. The reality I think is even worst in the rural India. The force driving the rural youth towards cities in search of petty jobs is still continuing and at least I have not come across any data supporting the case that such migration is in real terms getting down even when our growth rates are positive and are being appreciated by all. The book provides an excellent account of rationalizing the existence of democratic practices and the comparison between democracy in America and Scandavian countries is tracked and elaborated very eloquently. A realization driven by the personal experience at the Tahrir Square (situated at the downtown Cairo in Egypt which is also knows as Martyrs’ Square) further reiterates the merit of democracy. Ironically in India we do see mockery of democracy (many in social media term it as demoncracy in Indian context) however as a form of government still it carries more merits and judicious fairness as compared to dictatorship or autocratic rule of state. The story of young aspiring Raju (as narrated in India Unbound) who portrayed the future of young through learning Windows and English reminds me of another low of Indian corporate aspiration through the case of Raju of Satyam and Raja of Indian telecom scam fame (for wrong reasons). The appreciation of Anna Hazare movement as an awakening call is illustrated at many places in the book, however the author does not subscribe to all that this movement followed. In order to build a case for poor governance, the cases of Jessica Lal and Ruchika apart from many others are cited. These are not stray cases, these are happening day in and day out in all cities and villages, at all places. Crony capitalism has somehow found a concrete grounding in the Indian development story. The purchase and sale of favor is at rampant and the politicians playing the middlemen have become so acceptable that aspiring bidders first form nexus and then manipulate the whole process. The analogies from Mahabharata are cited at many places. It is important to mention here about the great work of Gurcharan Das in the shape of a book entitled Difficulty of Being Good – on the subtle art of dharma. Dharma as a proxy for moral well-being and artha as a proxy for material well-being are narrated through the text very convincingly. Gandhian way of promoting small business and developing industries on the basic premise of self sustenance is questioned and in a way big-push theory of economic development is advocated by the author highlighting and illustrating its strengths over welfare economy. I have my personal reservations on that and feel that it is the prime spice of bottom-up approach to development as against top-down approach as followed by China and well explained by the author in the book. The suggestions towards the end of the book through borrowing the title of the chapter What Is To Be Done from Vladimir Lenin’s prescription providing a solution and treatment of working class in erstwhile USSR, as to looking for political alternatives (as seems there is no other better way to seek justice and improve governance) through initiating to revive swatantra party or starting a new political party at the national level as both the large parties viz., Congress and the BJP are losing people trust, is a very welcome suggestion. I too feel that an awakened India would certainly like to see the change at the top and would commit oneself and pray for the cause for a better India which does not only grow at night, rather during the day as well and there is never a scene when the government really sleeps. I admire Shakespeare for his farsighted and ubiquitous statement ‘great men work when others sleep’. The book is a simple read making a strong case for liberating India from the clutches of corrupt individuals and showing us a path which could help the state to deal with governance deficit successfully. It is a richly referenced book defending the viewpoint of the author very nicely. I recommend this book to all who are concerned about the future of India.